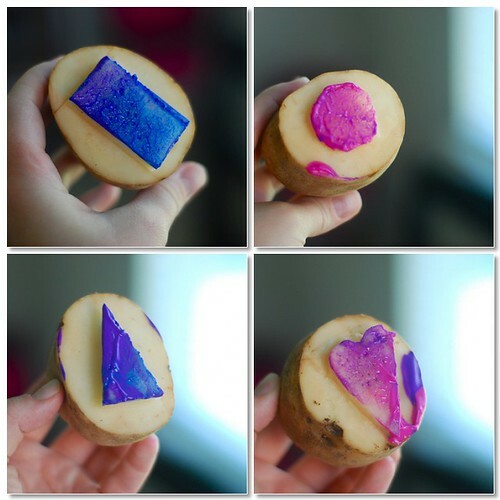 I've seen potato stamping several places over the internet.....and I have been wanting to do this for a while. There are so many different ways you can cut your potato...but I decided for us to do shapes. I let Parker tell me her shape....then I tried to cut it! They turned out....ok. Good enough, I guess! I cut 2 potatoes in half...thus making the 4 different shapes. Our friend, Kelli, told us about this great site: Online Learning Games from Fisher-Price. There are quite a few games on there for infants, toddlers, and preschoolers. Parker really likes the ABCs. The other day she asked if she could "play the ABCs on the comp-ooter." I obliged....and was so pleasantly surprised when she sang right along with them!! She has been able to identify all of the letters for a while now...but I never really took the time to teach her to sing the ABCs. But now she has caught on!! And when she was done...Geoff and I both clapped and praised her.....and she leaned into me for a hug....while she giggled and smiled....so proud of herself! She seemed to enjoy herself! I got this idea from Children's Learning Activites (Quick and Easy Number Book). And after completing this activity...I realized that we need to do more activities with numbers! With that being said....she doesn't get too excited about numbers. I try to work it into our everyday (counting bites, steps, etc)....and sometimes she seems interested....but most of the time she turns away and ignores me. I don't want to push the subject....but it has inspired me to come up with some interesting and fun ways to teach her numbers. I made 2 of these books. (They are made out of computer paper.) I numbered each page with a number, 0-10. Instead of just saving the second book for another time....I went ahead and let her do the second book all by herself! She just wanted to dot the actual number!! Ha! This activity is also from Children's Learning Activities (stringing bottle caps). We collected these bottle caps before Grace was born and they had just been sitting in our laundry room. On day last week I was out running errands...and when I came home, Geoff told me he had finally drilled the holes in the bottle caps. Perfect! Only problem was.....I failed to mention the size of the hole that I wanted. So he ended up making them a little too small. And to my surprise....she didn't do too bad! Her half- smile....trying to be modest as I am cheering and clapping for her! And Lovey was there, too, of course. I wouldn't say she got 'frustrated'...but you could tell that it was a little tedious for her. She was ready to quit after this (mind you...she really only strung 2 by herself....which I was still really proud of). I then thought that maybe she would have an easier time if I gave her pipe cleaner to string the bottle caps because it is so much sturdier than string. But by this point...she was done. I quickly made one to try to get her excited about it and possibly wear it....but again...she was disinterested. She did a lot of painting this week. She would just come up to me and tell me that she wanted to paint, so I just let her. She would even tell me that she wanted to paint right in the middle of doing another activity I had planned (which was a little frustrating for me, ha!)! She couldn't get enough! She played with her beans and rice sensory tub. This is a great activity that keeps her occupied for a while if I need to do something (such as cook dinner, feed Grace, etc) or if she is not wanting to play independently....or if we are just bored and want something to do that is quick and easy! I just keep the rice and beans in this zip-loc....and she pours them into this tub (that I believe I got from the hospital when I had her). These measuring cups are new. I got them for $1.00 at Michael's. She even cooked them on her stove! And here is yet another activity from Children's Learning Activities (Surprise, surprise!) This was one of the first toddler learning activity sites I stumbled upon and have just kept going back. However...since joining up with 1+1+1=1....I have found so many more sites and ideas that I am very excited about! We made rough, soft, smooth, and bumpy cards. For the 'rough,' we used salt. And for the 'bumpy,' we used sunflower seeds. For the soft....we used some scrap material from Parker's quilt. Just one suggestion.....take a look at the 'rough' card. There's not much salt on it. This is because I had her spread the glue out so it was a thin layer on the card. Anyway...the salt did not stick very well. I went back later and added a lot of glue.....and although the salt still kind of went everywhere....a lot of glue is definitely the way to go! I am linking up with 1+1+1=1's Tot School link today! Visit this site to get tons and tons of more tot activity ideas! Great jobs! Ya'll just amaze me! Tell her that Aunt "B" is so proud of her alphabet knowledge too!